Bravo, I see that you have advanced. As you point out, it's a long task to modify the climatic regions of the "TerrainTypes.raw" file, add new missing regions in silent hunter and create unique textures for each region and seasons. It seems that we had the same idea and intention almost at the same time. I no longer play sh3. But according to your previous explanations, there are many common points between sh3 and sh5 files. The difference may be in the system of vegetation textures. They are 2048x256. Each texture is composed of 8 trees, representing a season. So there are 4 textures for a climate region. I work on textures of 4096x512 and 2048x256 to create 2 versions. One normal and one full resolution. The graphics and the artistic part are the areas where I feel at ease. Conversely, the technical part bothers me and annoys me. So I decided to concentrate for now, on the climatic regions that already exist in the game. I will follow closely the evolution of your project. Last edited by astradeus; 12-20-2016 at 03:30 PM. As you point out, it's a long task to modify the climatic regions of the "TerrainTypes.raw" file. TerrainTypes.raw is not big problem, I finished it long ago, and liked it to be simple. The long task in SH3 for me are the forests files. The forest file is responsible for distribution of the trees on the terrain. It's a .dat file with many placement nodes, where you call specific tree and give it coordinates. And one forest file may contain hundreds or thousands of placement, so it's tedious, I don't do it every day. Indeed, it is a Colossal work that you have undertaken. I even wonder if it's reasonable? Why give so much importance to the placement of these trees? Here is the reference that I wish to use to modify the map "TerrainTypes" of the climatic regions. 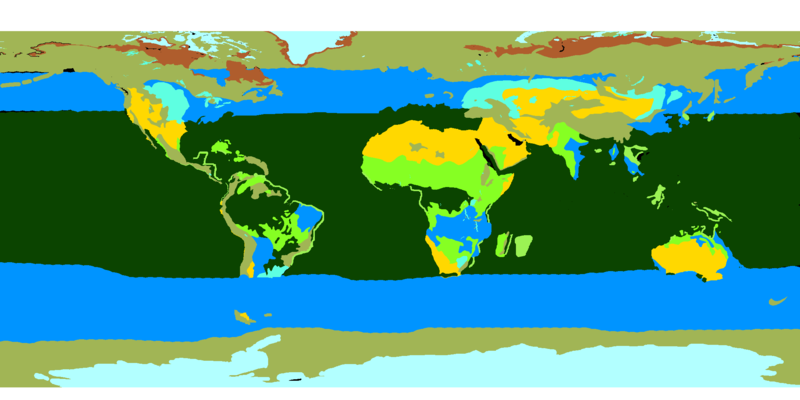 This is the "köppen climate classification"
I think it is possible to create more than 20 climatic regions with their unique vegetation. Last edited by astradeus; 12-20-2016 at 10:02 PM. 1. Would it be possible to have the same placement for the trees during summer and winter ? Because if (for example) you place correctly a bunker in summer, sometimes in winter there are trees just on it, and it's so bad looking ! 2. What is that ? I am not very sure, but I think it represents an area of vegetation. Unless otherwise stated, each yellow dot represents a tree. The goal is to organize this set of points so that they are more natural or more concentrated or more. Indeed, it is a Colossal work that you have undertaken. Well, If I take myself in hands, I will make forest file with 1000 trees just for two max three days. But for various reasons, I'm not in the mood for that, so that will extend to several months. I will speak for SH3. Original TerrainTypes.raw have over 30 shades, so this is possibility for over 30 terrain types. Then is simplified through Terrain.cfg to 9 terrain types. So, even only with editings to [IdxConversion] is possible to make more terrain type of some regions. But, I decided to make my own. My approach is to do it simple, only 12 shades. First shade cover the whole world, I call it generic. Then over it I draw, not too deep in land, next 11 shades. There is no point, to draw something in the middle of the continents. Well this is the right way to do it, don't change coordinates, just change the trees to autumn/winter variant. How is it in the original files, I did not checked. My way to make the forest file, will describe soon. Last edited by Tycho; 12-27-2016 at 01:28 PM. Editings of this post: How the terrain texturing work. I changed and added something important about Tex04. No answer, I thought you were gone. I am currently testing a map that I have created and that seems operational. It contains 32 different types of vegetation zones. But I am not yet satisfied with the accuracy of the actual data. This is my trial version. I chose to make big, because even if all zones are not exploited immediately, it is possible to associate several [IdxConversion] with the same type of vegetation. And I accomplish my trees in completely different approach than original game. Can you give me more explanations on this subject? In my experimentation for sh5, I am looking for a way to get a better rendering of the textures in the game. I thought to modify the models "vegetation.GR2"
Or use the normal map textures for trees. Last edited by astradeus; 12-28-2016 at 08:47 AM. I am currently testing a map that I have created and that seems operational. It contains 32 different types of vegetation zones. I think it would be cool to add new climates based on local climate + the altitude : firs in high altitude, and even no trees but only rocks or ice for very high altitudes. I'm trying to get the torpedoes working. But the DD shoots the torpedo only to 90 degrees (elevation) and it falls into water immediately after being shot. Now I saw that last time when I work on my terrain and forest files is end of january. Will finish this probably when the autumn come. But now I have something new. Very interesting. But I'm on vacantion now, when get home will show and give you. Until then, I'll let you guess. But now I have something new. Very interesting ... I'll let you guess. May I guess without any clues ?